When April showers aren't prepping May flowers, we can be found in the backyard flexing our green thumbs. Since we're no professionals in the world of gardening, digital resources are a must in learning which plants will thrive in a specific climate and how to produce vegetables worthy of a farmers market. Download one of these five apps this weekend to get your Spring (and Earth Month!) gardening in gear. Landscaper's Companion ($5) - Need to know how to grow just about anything under the sun? With facts on over 22,000 plants, this app is your gardening go-to. You won't want to hit the garden store without downloading this. Home Outside Palette ($2) - Draft a dream backyard to rival those on the pages of the most beautiful gardening magazine. 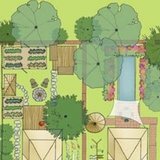 Plot sections of produce, deck space, hammocks, or quiet meditation gardens to turn a drab backyard into a relaxation center. Botany Buddy ($10) - Identify over 2,000 plant, tree, and shrub varieties with the nearly 10,000 color photos. The detailed search functions find multiple varieties of a plant species and help identify which is best with your gardening requirements. GardenMinder (free) - Feel like your thumbs will never turn green? With push reminders and how-tos, the GardenMinder will keep your plants in bloom. There's also a journal so you can track your garden's progress. Harvest Select the Best Produce ($2) - After you've planted and watched your garden grow, how do you know when the produce is ready to eat? The app is filled with tricks for identifying ripe vegetables, storing instructions, and tips on which grocery store finds come in contact with pesticides if you decide to buy your produce instead.